We have a standing playdate at a Chelsea playground on Thursdays with some local blogger pals (and their littles): Joanna, Abbey, Sharon and Ashley. When you’re going to be sitting in the sandbox and getting Pirate’s Booty crumbs all over you—you best cas(ual) it up. Still, this is NYC and jogging suits won’t cut it. 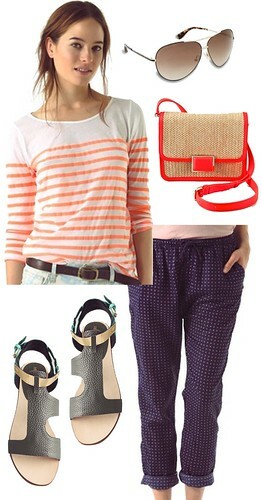 We always seem to go for a tomboy look with a feminine touch (slouchy trousers or jeans, t-shirts and sandals).